All one needs to steep authentic iced tea! Tea Forte's Tea Over Ice® Pitcher Set includes two sculpturally designed, heat resistant Steep & Chill™ pitchers that stack for a dramatic presentation and one Sampler box of five assorted iced tea infusers(one pyramid each: Ceylon Gold, Blood Orange, Mango Peach, Ginger Pear and Raspberry Nectar). Steep hot tea in the lidded upper pitcher and then flash-chill deliciously fresh iced tea by pouring the brewed beverage into the ice in the lower pitcher for immediate service. The proportions of hot water, tea and ice are perfectly balanced to produce a fresh 24 oz. pitcher of iced tea with each infuser. Send this unique pitcher set that has all they'll need to steep authentic iced tea with ease! 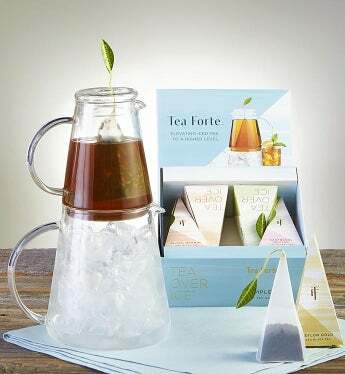 Tea Forte's Tea Over Ice® Pitcher Set includes two heat resistant Steep & Chill™ pitchers that stack for a dramatic presentation and one Sampler box of assorted iced tea infusers in intriguing blends such as Mango Peach and Ginger Pear. Steep hot tea in the lidded upper pitcher and then flash-chill deliciously fresh iced tea by pouring the brewed beverage into the ice in the lower pitcher for immediate service.